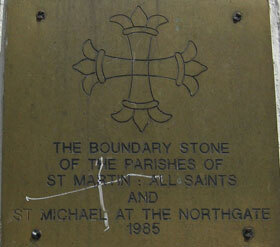 Below are seven inscriptions marking the parish boundary of St Michael’s with the three old adjoining parishes of St Martin, All Saints, and St Mary-the-Virgin or St Peter-le-Bailey. 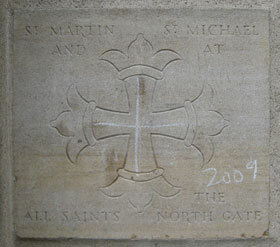 As the churches of St Martin and All Saints were united in 1896 (when most of St Martin’s Church at Carfax was demolished), and St Michael’s and St Martin & All Saints were united in 1971 (when All Saints church became Lincoln College library), some of the stones now mark nonexistent boundaries. 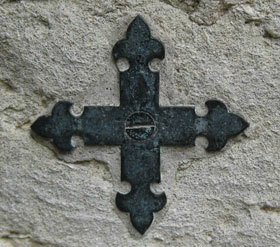 All have a St Michael’s Cross, or a simplified version of it. 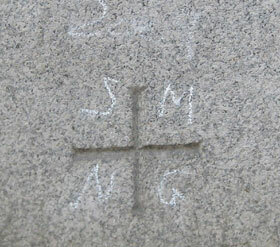 Some of the photographs show a chalked cross or the letters SMNG (for St Michael-at-the-Northgate) that were added at the beating of the bounds on 21 May 2009. 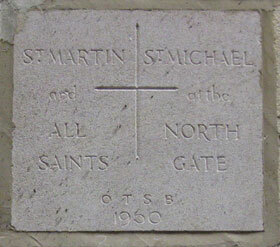 Parishes of St Martin, All Saints, and St Michael-at-the-Northgate once met here. 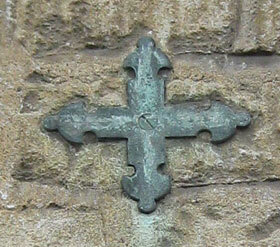 Marked O T S B and dated 1960 (when building was occupied by Oxford Trustee Savings Bank). 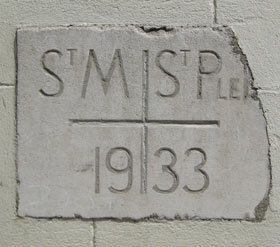 Redundant, as all three parishes are now one. 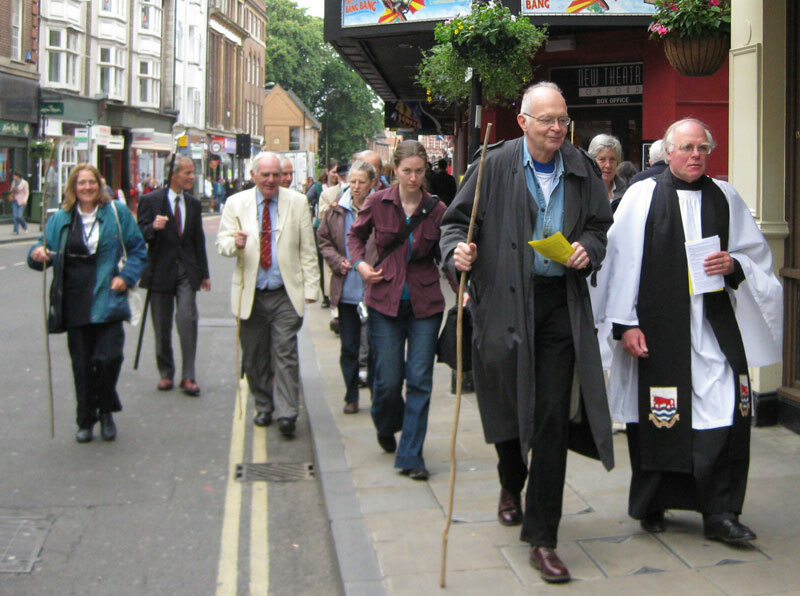 The Vicar marches from the church with the choir in red cassocks and some Lincoln College undergraduates wearing subfusc. 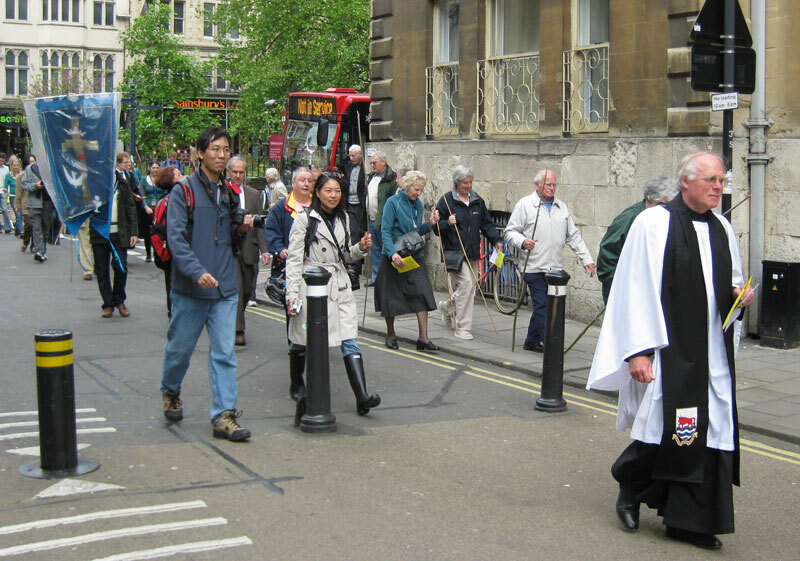 They all carry long willow rods with which to beat the bounds, and the Vicar draws a cross in chalk on each of the surviving parish boundary stones. Through Monsoon at 35 Queen Street and back into the Clarendon Centre, across Cornmarket, and through Boots, the City Tavern, and the covered market to lunch in Lincoln College.